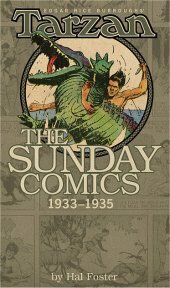 Creator of Tarzan® and "Grandfather of American Science Fiction"
The day his delirium passed, Prince Kamur went to his father to demand the hand of Queen Nikotris in marriage. 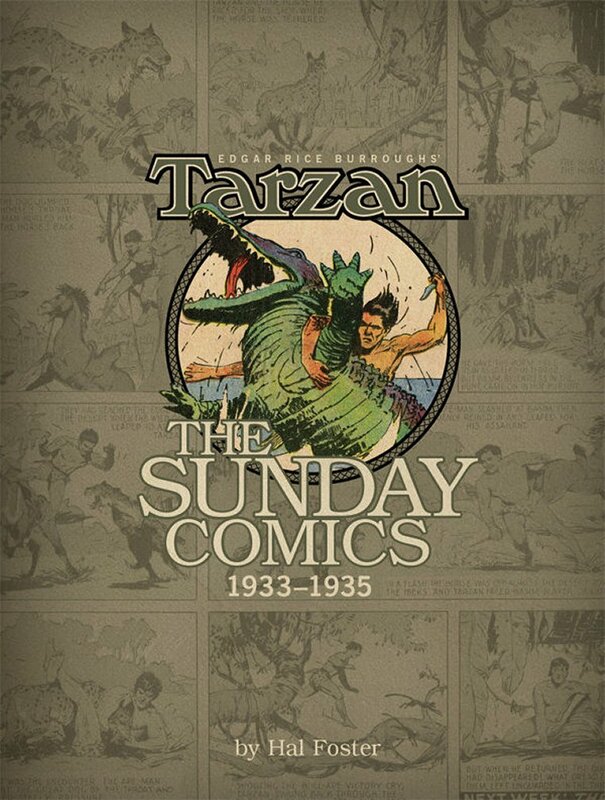 When told the queen had fled with Tarzan, Kamur, in violent rage, throttled news of their whereabouts out of the king. As he left his father's tent, he saw a riderless horse dashing among the tents. It was the horse upon which Tarzan had escaped from the Ibeks. 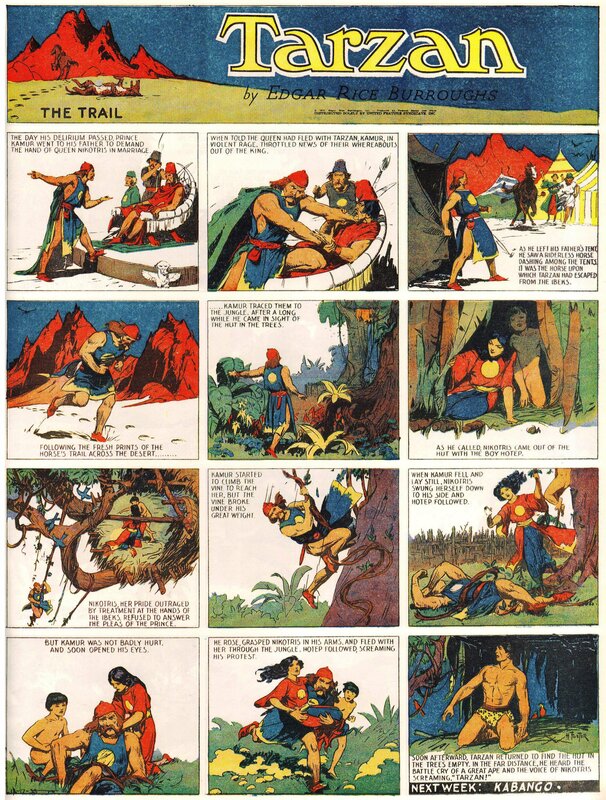 Following the fresh prints of the horse's trail across the desert Kamur traced them to the jungle. After a long while he came in sight of the hut in the trees. As he called, Nikotris came out of the hut with the boy Hotep. Nikotris, her pride outraged by treatment at the hands of the Ibeks, refused to answer the pleas of the prince. Kamur started to climb the vine to reach her, but the vine broke under his great weight. When Kamur fell and lay still, Nikotris swung herself down to his side and Hotep followed. But Kamur was not badly hurt, and soon opened his eyes. He rose, grasped Nikotris in his arms, and fled with her through the jungle. Hotep followed, screaming his protest. 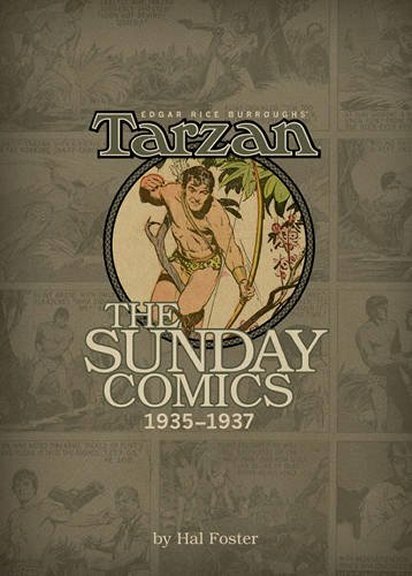 Soon afterward, Tarzan returned to find the hut in the trees empty. 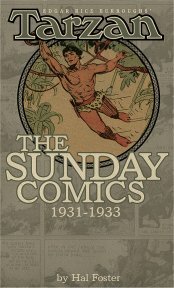 In the far distance he heard the battle cry of a great ape and the voice of Nikotris screaming, "Tarzan!" The strips in our ERBzine series are small samples of the giant supersize 15" x 20" reprints now available from Dark Horse Books. 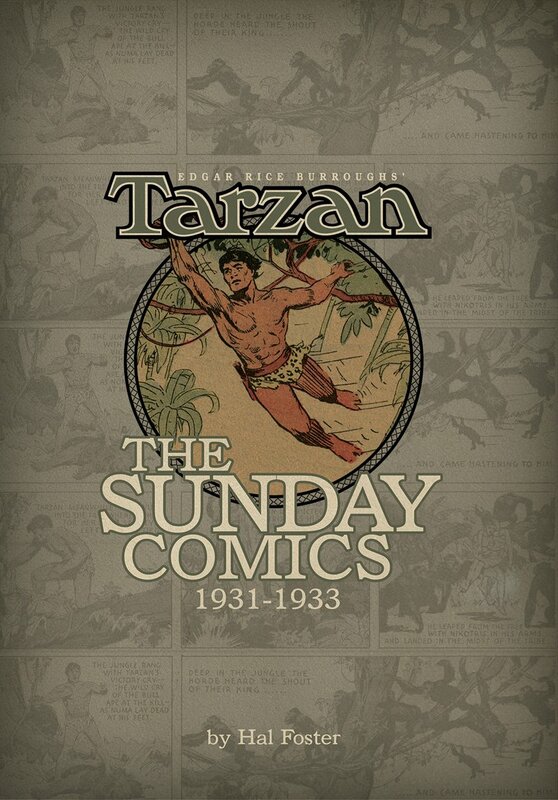 Each hard cover volume of Dark Horse's comprehensive collections of Hal Foster's Tarzan Sundays reprints over 120 strips on high-quality paper and in eye-popping color, replicating their appearance back in the 1930s when they were brand new! 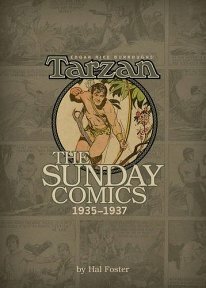 Featuring historical essays on Tarzan and Foster, these astonishing volumes are a must for every collector!